I love cheese, I have to restrict my intake otherwise I would pile on the pounds, so when I do eat cheese I like it to be good quality and packed with flavour. 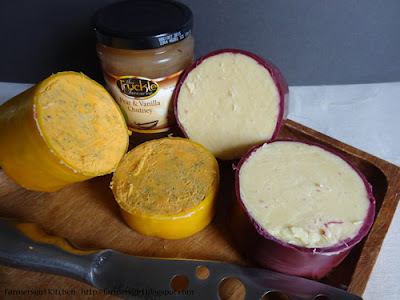 I was delighted to be approached by the Truckle Cheese Company to review some of their cheeses. 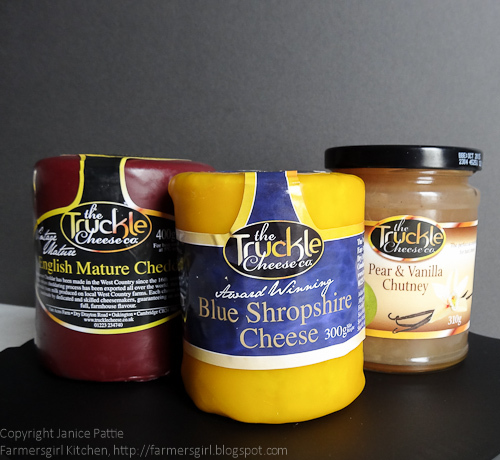 The Truckle Cheese Co is one of the UK’s leading producers of carefully crafted cheeses, marmalades and terrines. From its base in Cambridge, the company has created recipes for an assortment of stunning cheeses including the mature, vintage cheddar cheese truckle, an award winning Blue Stilton and the innovative Revelation Cheddar, which carefully blends delicious mature cheddar with the indulgence of dark chocolate curls. I chose to review The Truckle Cheese Co. English Mature, Vintage Cheddar, and the Blue Shopshire Cheese and Pear and Vanilla Chutney. The Mature Vintage Cheddar is very smooth, cuts well and has a very pleasant tangy flavour without being harsh. This is definitely a 'cheeseboard' cheese, I felt it would be wrong to cook with it as it was simply too good. But I think it would be perfect in a cheese sauce for haddock mornay, mac n cheese or cauliflower cheese, it has the depth of flavour to really enhance those dishes. I had asked to review the Pear and Vanilla Chutney as I was intrigued at the thought of vanilla in chutney. The texture of this relish is soft, almost like a pear puree although there are pieces of fruit through it too. The flavour is very soft and delicate, I tried it with the cheddar, but found it became a little lost against the strong flavoured cheese. It is, however, perfect with cold meats like ham or cooked chicken where the sweeetness and low acidity works very well. These products and more are available mail order from The Truckle Cheese Co. I was supplied with the cheeses and chutney by The Truckle Cheese Co. I was not paid for this post and all opinions are my own. Prices are correct at time of publication.